Probably one of the most well-loved foods in the country, pizza is offered in almost every restaurants, and it always includes a crust of some kind, as well as sauce and toppings. People with certain food allergies, however, must proceed with caution when eating pizza. Depending on the recipe, most pizza contains one or more of the top eight food allergens, which include peanuts, tree nuts, milk, eggs, wheat, soy, fish and shellfish. Pizza isn't really pizza without a layer of hot, gooey cheese, but if you have a milk allergy, you don't want cheese on your slice. An allergy to cow's milk is the most common allergy among infants and children, and approximately 2.5 percent of children under the age of 3 are allergic to milk, according to the Food Allergy Research and Education website. Adults can also be allergic to cow's milk, however. An allergic reaction to milk can range from mild to life-threatening and include symptoms such as wheezing, trouble breathing, hives, itching and swelling. Fortunately, it's fairly simple to avoid cheese on pizza or to replace cow's milk cheese with an alternative such as soy cheese. Most pizza crust contains wheat, and certain proteins in wheat, such as gluten, are responsible for a wheat allergy. A wheat allergy is different from a gluten intolerance, however, because a true allergy is a reaction from your body in response to the wheat. A gluten intolerance is a digestive disease, the Food Allergy Research and Education website notes. Like a milk allergy, a wheat allergy can cause breathing difficulties, swelling, itching and hives. 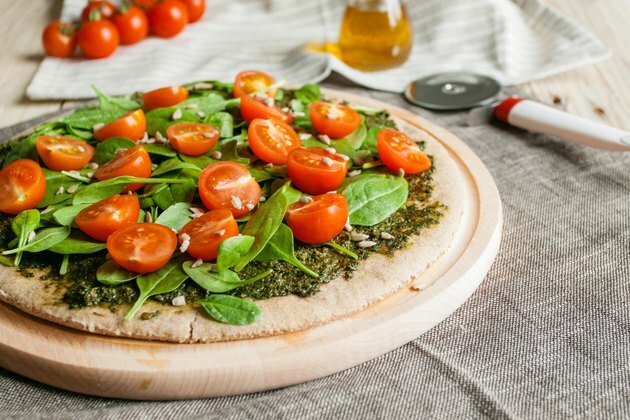 Pizza crusts made with different grain flours, such as oat, amaranth, quinoa, corn, oat and rice, are an alternative if you have a wheat allergy but don't want to give up pizza. Many pizza crust recipes call for eggs, another potential allergen when you want to eat a slice. It's the protein in the egg whites that causes the problem, although people with an egg allergy can't eat the yolks either since the two parts can't be completely separated, according to the Food Allergy Research and Education website. People with an allergy to other foods, such as peanuts, tree nuts or soy, might also need to avoid traditional pizza crust as certain recipes call for items such as peanut oil or soybean oil. Egg, peanut and tree nut allergies can be life-threatening and can cause breathing difficulties, itching and swelling. A crust made without eggs, with an alternative oil, such as olive or canola, are necessary to make pizza safe for you. Certain sauces and toppings may pose an allergen hazard. For example, if you're allergic to tree nuts, you'll need to skip pizza that contains pesto, which is made with pine nuts, and if you're allergic to shellfish, you can't eat pizza with shrimp or other seafood toppings. Even imitation shellfish, such as imitation crab, can pose a danger, according to Bruce S. Dobozin, M.D. and Stuart H. Young, M.D., authors of "Allergies: The Complete Guide to Diagnosis, Treatment, and Daily Management." Though not as common, it's possible to be allergic to other foods outside of the most-common eight, Dobozin and Young note. For example, you may even be allergic to tomato sauce, garlic, onions or the additives in meat such as sausage and pepperoni. Allergies: The Complete Guide to Diagnosis, Treatment and Daily Management; Bruce S. Dobozin M.D. and Stuart H. Young M.D. Why Does Pizza Give Me Diarrhea?